Flying the Samsung-branded flag for the mid-range smartphone market is the Samsung Galaxy W, a handset also known as the Samsung GT-I8150. Having taken the high-end smartphone market by storm with the Samsung Galaxy S and subsequent Samsung Galaxy S2, Korean tech giant Samsung is now intent on dominating the full mobile phone scene with a flurry of boundary-pushing handsets. 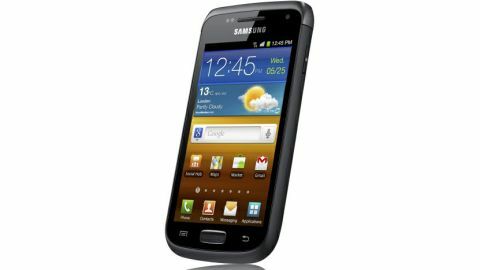 With a 3.7-inch form factor and Android 2.3 Gingerbread operating system, the Samsung Galaxy W pushes the boundaries of its lower mid-range smartphone price point. The phone features a strong 1.4GHz single-core processor, offering the grunt to power a handset that also packs a 5MP rear-mounted camera, 720p HD video recording capabilities, 512MB of RAM and a flurry of connectivity options. Touting an array of specs comparable to former top high-end Android smartphone the HTC Desire, the Samsung Galaxy W perfectly demonstrates exactly how quickly the smartphone scene is evolving. The Samsung Galaxy W is set to duke it out with other 3.7-inch Android smartphones such as the Motorola Defy+, while its 1.4GHz Qualcomm processor is the same speed as that of the Sony Ericsson Xperia Arc S, and faster than the 1.2GHz offering on the BlackBerry Torch 9860, both of which cost around £100 more than the Samsung Galaxy W, priced at around £249.99 on Pay As You Go. A relatively compact handset, the Samsung Galaxy W - in which the 'W' stands for 'Wonder' - features an aesthetically pleasing form factor, with the handset's 3.7-inch WVGA LCD capacitive touchscreen boasting a 480 x 800p resolution. The smartphone's interface enables you to seamlessly access desired content and use the extensive array of app-based content on the pre-loaded Android Market. Offering a lot of bang for your buck, the Wi-Fi, 3G, Bluetooth 3.0 and GPS-enabled Samsung Galaxy W lands with a spec far superior to that of a number of its similarly priced competitors. Lining up at a respectable 11.5mm thick, just 0.2mm thicker than the HTC Sensation, the Samsung Galaxy W's round edged design might not be first in line for any beauty awards, but it is a form that in no way offends on an aesthetic front. With the handset's rigid and compact design resulting in a 114.7g weight, the Samsung Galaxy W is just over a gram lighter than the 116g heft of its 4.3-inch Super AMOLED-touting high-end sibling, the Samsung Galaxy S2. Relatively well crafted with little flex or distortion when put under extreme pressure, the two-toned body of the Samsung Galaxy W is let down considerably by the over-apparent join between the main shell and the removable back plate, which runs like a parting seam around eight tenths of the handset's edging. In typical Samsung Galaxy fashion, the W's removable back panel is scarily thin and unnervingly delicate. When removing it, it seems so fragile that you fear a snap any time you take it off to replace the SIM, battery or well-hidden microSD storage card. Comfortable and unobtrusive in the hand, the Samsung Galaxy W features a design that fails to accentuate its key features. Although not noticeably overpowering at first glance, the phone's bezel can at times make the device's screen feel quite narrow, detracting from the otherwise pleasant visual offering. Although not offering an on-screen experience with as much pop or attention-grabbing vibrancy as its high-end rivals, the Samsung Galaxy W features a more than acceptable screen. The capacitive touchscreen display sports the same dimensions and 480 x 800p resolution as the ClearBlack AMOLED offering on the Windows Phone-powered Nokia Lumia 710. Accentuating the handset's smooth design traits, the USB connector-come-charging port is hidden beneath a sliding tab, a move that aids the appealing aesthetic but can make it fiddly to open and access. Weighing down heavily on the side of the touchscreen revolution, the Samsung Galaxy W features just three physical buttons, with a raised home button landing alongside well-placed volume controls and a power switch. Everything else is touch-based, including the Android standard back button and option key, something that might not appease traditionalists but certainly bolsters the smartphone's physical appeal.